1 QW09 smart watch. Hi, we are lemfo from China. Our main products are phone cases. RAM 512 MB ROM 4GB. Bluetooth 4.0/WiFi Supported. OS: Android 4.4, CPU: MT6572A. Frequency Band: 3G :WCDMA : B1 B2 2100/1900MHZ 900/850. Android 5.1, advanced CPU MTK6580 Quad core 1.0GHz, quick data processing. ROM 16GB and RAM 1GB. CPU: MTK6580 1.0GHz, Quad Core. Support WiFi 802.11b/g/n connection, convenient for you to get web. Model: THOR Pro. Kingwear KW99 Smart Watch. Bring KW99 on your next adventure no matter the weather. A bit of rain and sweat will not stop you or your KW99. KW99 is embedded with a selection of exclusive customized watch faces, and you can download more as you like. Zeblaze THOR 4 PRO. Support WiFi, weather, clock face for any occasion, app. 4G FDD: 2100(B1)/1900(B2)/1800(B3)/850(B5)/2600(B7)/900(B8)/B12/800(B20). Screen Size. 1 THOR 4 PRO Smart Watch, 1 Cable, 1 User Manual (English). Support iOS 11.0 version above and Android 6.0 version above. RAM 2gb 16gb in flash. OS: Android 7.1.1, CPU: MT6739 Quad core. Frequency band: 4g LTE-FDDB1 / B2 / B3 / B5 / B7 / B12 / B20. Bluetooth speakers, smart watches, etc. Hi, we are lemfo from China. Our main products are phone cases. OS Android 5.1. Many kinds of fantastic user interfaces. When the android system updated, the dial also can be updated more and different. Support Nano SIM card and 2G GSM & 3G WCDMA network. 3G: WCDMA 850 / 2100Mhz. Android 5.1, advanced CPU MTK6580 Quad core 1.0GHz, quick data processing. ROM 16GB and RAM 1GB. Support WiFi 802.11b/g/n connection, convenient for you to get web. THOR 4 Dual. Android 7.1.1. Android 4.4 or above, iOS 9.0 or above. 4G FDD: 2100(B1)/1900(B2)/1800(B3)/850(B5)/2600(B7)/900(B8)/B12/800(B20). Watch Language. 1 Smart Watch. Dual-band(2.4GHz/5GHz)single stream802.11a/b/g/n MAC/BB/RF. 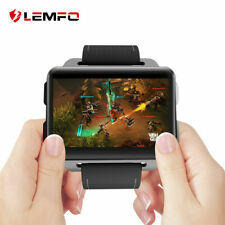 LEMFO LF16 Android 5.1 MTK6580 Smart Watch Phone. The LF16 has the aesthetics of a truly premium watch design. You get to feel free with LF16. LF16 supports nano SIM card. The thickness of lf16 body is only 1.2cm. New listingApple Watch Series 4 44mm Space Grey WiFi Used A++ Condition, Must see! Fantastic condition Apple Watch Series 4, 44mm space grey WiFi not cellular. Comes boxed with all standard black sports straps, cables and charging socket, will throw in the charging dock. Clean mint condition, used lightly for a few weeks before reverting to my dedicated Garmin sports watch. A gorgeous, high functioning watch which needs its forever home. Too good to be sat unused. Happy for it to be collected in person, if there is a deposit paid up front. Will send Royal Mail Special to ensure it is fully covered. Any questions please ask. Model: Zeblaze THOR PRO. WIFI: 802.11b / g / n. Stylish appearance for any occasion. CPU: MTK6580 1.0GHz, quad core. OTA upgrade: yes. If you do not receive our reply within 48 hours, pls. If you are satisfied with our service, pls. SIM Card: Nano SIM. 4G all-network smartwatch. It supports heart rate monitoring, blood pressure monitoring, SMS, EDGE, recording, continuous shooting and APP download. Frequency Band: GSM: 900mhz/1800mhz/1900mhz. Zeblaze THOR 4 PRO. Support WiFi, weather, clock face for any occasion, app. 4G FDD: 2100(B1)/1900(B2)/1800(B3)/850(B5)/2600(B7)/900(B8)/B12/800(B20). Network Frequency. 1 THOR 4 PRO Smart Watch, 1 Cable, 1 User Manual (English). Features: With 5.0M camera to take beautiful pictures. Support Micro-SIM Card to use as a phone. 600mAh large capacity Li-ion Battery. Standby time of 120 hours, talk time of 270 minutes. Play music time of 6 hours, support mp3/acc/amr/ogg/m4a/mid/wma/flac/ape/aac/wav. Support GPS, WIFI and FM radio. Description:. The waterproof smart watch is suitable for IOS and Android smartphone. Compatibility: Suitable for most Android and IOS smartphone, such as iPhone, Samsung and Mate. 4G Smart Watch is a powerful wrist bracelet with call function and high-speed 4G network. KC03 Digital Smart Watch Wifi Android 6.0 BT-4.0 4G Heart Rate Phone Smartwatch. KC03 Smartwatch Phone 4G Android 6.0 MTK 6737 1.2GHz 1GB RAM 16GB ROM. OS:Android 6.0. Sedentary Reminder Bluetooth 4.0 620mAh Built-in. Bluetooth: 4.0, compatible with both IOS and Android OS. Antenna: Ceramic Bluetooth Antenna. Call Logs: Local Call Logs, Bluetooth Call Logs. Dial: Local Dial, Bluetooth Dial. Settings: Bluetooth settings, Sound, Display, Power Save Model, Flight Mode, OS Update and Reset. Support Nano SIM card and 2G GSM & 3G WCDMA network. 3G: WCDMA 850 / 2100Mhz. Compatible for iOS 9.0 & Android 5.1 or above, with BT 4.0 it can connect with a phone to synchronize information. Compatibility: iOS 9.0 & Android 5.0 or Above. Model Z004. 512MB RAM 4GB ROM and support Micro SD card up to 32GB extended. MTK6572 dual core CPU, 1.3GHz Android 4.4. FM Radio Yes, earphone needed. 3G: WCDMA 850/2100. Earphone Port 3.5mm. OS Android 4.4 OS. 1.39” AMOLED Display. Screen type ： AMOLED. Waterproof ： IP67. Android 7.1.1 system. Dual 4G LTE. Global frequency bands, feel free to travel all over the world. Support dual 4G LTE, like TDD LTE and FDD LTE, and 5 types of network and 23kinds of frenquency bands including WCDMA, TD-SCDMA, GSM, etc. covering most of the countries and regions in the world. Hi, we are lemfo from China. Our main products are phone cases. Support nano SIM card. OS Android 5.1. Many kinds of fantastic user interfaces. When the android system updated, the dial also can be updated more and different.